Discovery Candidasa Cottages and Villas will be delighted to arrange the most attractive and interactive activities for guest satisfaction and memorable time during your holiday. We care in personalized services to each and every guest. 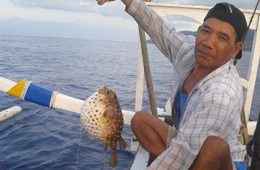 Many choices of diving experience within Candidasa area as well as other dive sport areas. There are some diving centers nearby the hotel. 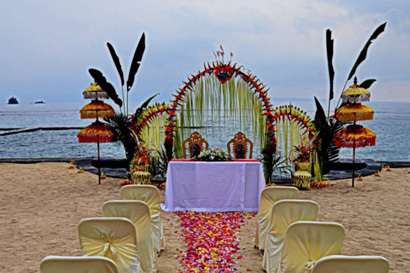 Their professional dive instructors will pleasantly assist and guide in pampering the beautiful underwater of Bali, either for beginner or advanced divers. Or visit the hidden White Sandy beach with a nice palm lined strip located about 6 Km eastward from Candidasa. 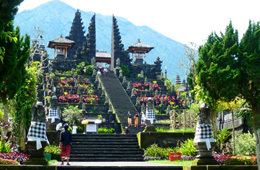 Bali's "mother temple" Pura Besakih, the largest and holiest temple in Bali, is over 900 meters up the slopes of Gunung Agung. 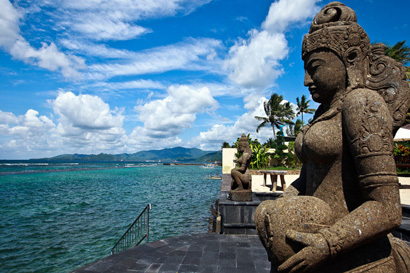 It has been regarded as a holy place since pre-historic times in Bali. The first recorded mention of its existence is from an inscription that dates from 1007 A.D. Since the Gelgel dynasty of the fifteenth century it has been regarded as a central, holy temple for the entire island. 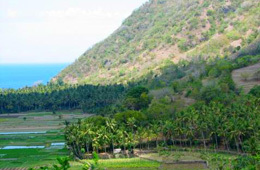 The village of Tenganan is very unique among the Bali Aga communities of the island in its strong adherence to traditional ways. Just a few years ago the village was almost isolated from the world. One could enter there through the only narrow gate. Tenganan at present is a wealthy village, and the only place in Indonesia that produces the celebrated geringsing double ikat weaving. 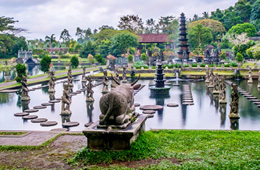 This water palace which is a series of pools and ponds with fountains and mythical statues was built by the last Raja/King of Karangasem, Anak Agung Anglurah around 1948. Tirtagangga's elegant palace was damaged on several occasions, including the 1963 eruption of Mount Agung. It isn't grand, but it's still a place of beauty and reminder of the former power of the Balinese rajahs. According to the legend, if you dip into the waters of Tirtagangga during a full moon, you can get youth and to be healed of many diseases. In Tirtaganga pools you can really swim. 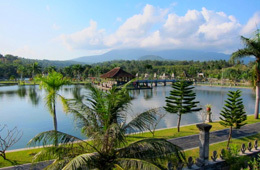 Taman Ujung Sukasada (water park) is a beautiful park with a pond which was used by the Karangasem's King for a day of relaxation or meeting place. It is located in Ujung Countryside about 5 Km from Amlapura town. This park originally had only one pool. At the period of I Gusti Bagus Jelantik governance this pool area was extended and developed by some pools and a luxury building Bale Gili with European style (modern style), also known as the floating palace. From this elevated vantage point guests can appreciate sweeping views of the ocean, the tranquil beauty of the volcanic Mount Agung and surrounding rice terraces. 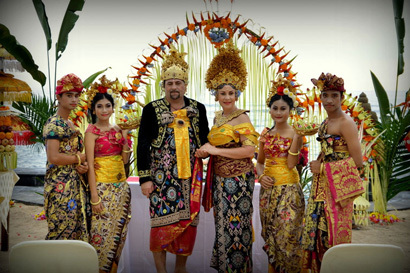 Puri Agung Palace, once served as a royal residence, is located in the town of Amlapura, East Bali. After a triple-gate with Balinese carvings visitors enter the palace courtyard with several buildings there. It is Bale London pavilion, the furniture of which is marked by the emblem of British royal family; Maskerdam (referring to Amsterdam) is the main building of Puri Agung; Kampang pavilion is located at a wonderful pond. Between the pond and pavilion there is Maskerdamom Pemandesan, a place where members of the royal family were cremated. Sometimes one of the pavilions can be closed, but that does not take away the charm of a walk through the landscaped grounds of the palace. 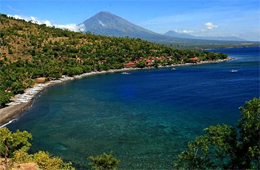 A hidden paradise at the eastern part of Karangasem regency, villages of the local fishermen, diver's favorite site for its shipwreck, colorful corals and fishes. Approximately 2 hours walking on a small path beside the rice field and tropical fruit plantation. 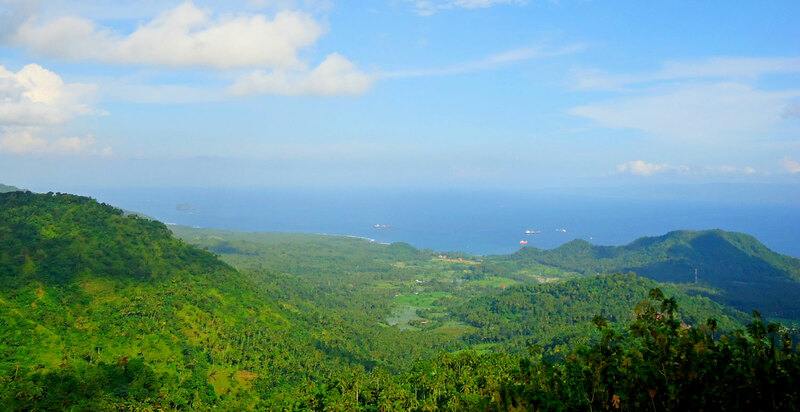 Feel the wind breeze meanwhile enjoying a splendid view of mount Agung, Lempuyang hill and the ocean seen from far away. 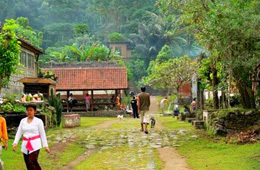 We will go trekking through Gumgum village (which means "on the top of the hill") and make a stop at Tenganan Village which is famous for keeping and maintaining the ancestors of Bali's original inhabitant's culture and traditions active to this day. 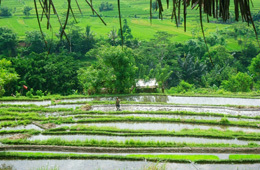 Totally flat easy trekking to see rice field panorama with many kinds of horticulture plantation. Sometimes you could see a farmer working in the day accompanied by a couple of cows. The highest volcano mount in Bali, depart from the hotel at 01.00 o'clock early in the morning, then 1 hour drive with a car to Pasar Agung temple. The journey or adventure begins from here climbing up in the fresh cold air. It is about 4 hours climbing up to the top, enjoying the sun rising on Bali. 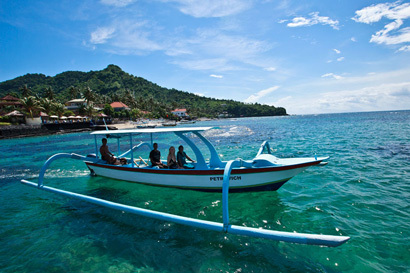 We can also arrange Bali Adventures, such as river rafting, Sea cruise, seawalker, elephant safari, cycling, marine sport, golf, ATV and buggy riding, horse riding, etc.